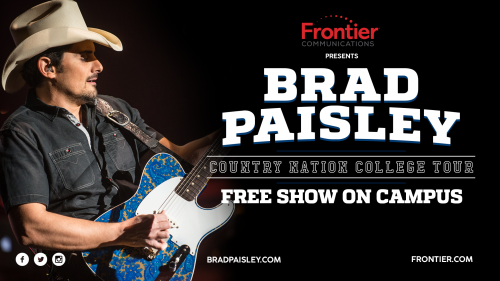 Following the success of the 2015 Brad Paisley Country Nation College Tour, the country music superstar will bring his free concerts to a new group of IMG College partners this fall with support from presenting sponsor Frontier Communications. The “Country Nation College Tour presented by Frontier Communications” will debut with a free show on Sunday, September 4th in Downtown Orlando, Florida, ahead of the Camping World Kickoff Game featuring Ole Miss vs. Florida State. Paisley will then travel to two IMG College partner universities during the month of September. Paisley returns to his home state for an on-campus show at West Virginia University on Friday, September 9th, in advance of the Mountaineers’ match-up with Youngstown State the following day. He will also perform at The Ohio State University on Thursday, September 15th. Additional stops on the “Country Nation College Tour presented by Frontier Communications” will be announced later this month. More than 120,000 fans took advantage of Paisley’s free Country Nation College Tour concerts in 2015. Paisley’s “Country Nation” single from his chart-topping album, Moonshine in the Trunk, debuted in 2015. Written by Paisley and his longtime collaborators Chris DuBois and Kelley Lovelace, “Country Nation” is a celebration of the college spirit and America’s passion for sports that weaves-in a shout-out to 18 college sports mascots. IMG, which serves more than 200 universities nationwide, is a division of WME | IMG, which also represents Paisley and brokered the college tour deal.